The very thought that chickens could be violent against their own kind is a somewhat laughable notion, even more so when you consider cannibalism. Could your lovely hens really resort to pecking one another to death and then consume their fallen coop mate? Absolutely, as frightening as that may sound. Cannibalism is a regular occurrence in flocks of chickens, but there are easily avoidable causes and ways to hopefully undo the damage. 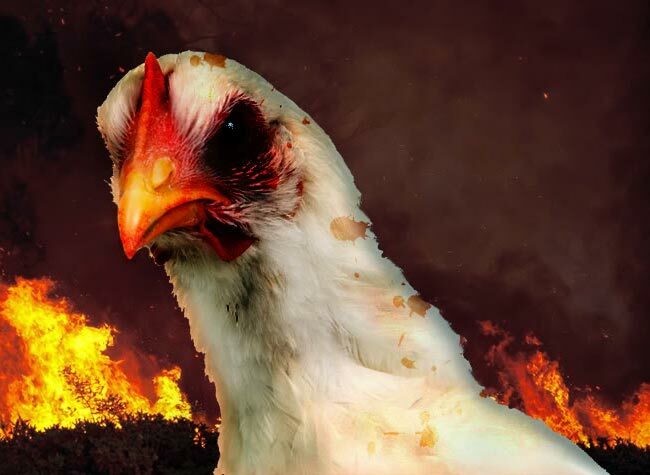 Here’s what you should know about cannibalism in chickens. As with most animals, the number one cause of cannibalism is a lack of a sufficient food supply. If you’re only giving enough feed to handle half of your birds, then there will be a definite increase in fighting and it could very well lead to hens dying and being eaten as a way to simply stay alive. The other most common reason comes down to cramped conditions, so keeping your chickens cooped up (literally) for too long can absolutely lead to this strange and violent behavior. Other factors are as little stranger. For instance, putting your chickens in wire cages increases the chance of cannibalism, as does lining the floor of their coop and run with sand. Apparently, chickens are extremely sensitive to these things and will lash out when given the chance, so simply avoid wire cages and sand floors whenever possible. Once the behavior sets in, it is critical that it is stopped as soon as possible since it only takes one bad hen to convert an entire flock. Chickens will follow the suggestions of fellow hens, so if they all see a hen pecking another to death and eating her in small bites, they’ll be more inclined to join in and collectively begin deciding which hen should be the next to go. Again, sometimes chickens are weird. So just like in a zombie outbreak, the goal is to eliminate the core of the problem before it infects everyone else and spreads like a plague. Finding that original chicken before the others begin acting out of line can be hard to do, but if you manage to find the perpetrator, remove her from the flock immediately. She can sadly never be integrated again, so you’ll either need to decide to put her in her own separate world, or turn her into dinner. As for the other chickens, there are a few things you can do to help reduce the likelihood of such a phenomenon. Providing more space in the yard for your chickens to run will help, even if it’s just a matter of increasing the length of their chicken run, though adding another coop can also help, as well as adding additional feeders. The best course of action is more space all around, so the more you can give, the better the chance of a safe flock. Chickens were never meant to eat one another, but it does happen sometimes. If you see it happening, move fast and act accordingly, otherwise you could be faced with a devastated flock in no time.